Noreen Joyce Brien - 82, of New Minas, Kings County, formerly of Centreville, Kings County, passed away peacefully, surrounded by her family on Friday, October 5, 2018 in the Valley Regional Hospital, Kentville. Born in on November 7, 1935 in Middleton, she was a daughter of the late Edison and Ora (Martin) Wentzell. She was a graduate of Middleton Regional High School. Following the retirement of her husband they lived in Centreville. 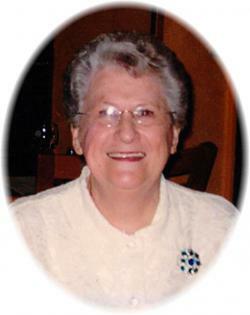 She attended the former Canard United Church, where she was an active member of the UCW. She was also active with the Centreville Good Neighbour Club. She especially enjoyed spending time with her grandchildren and great grandchildren. She is survived by her husband of 64 years, George; a daughter, Joanne (Simon), UK; three sons, Gary (Eva), Fall River; Michael (Jane), Dartmouth and Gordon (Patti), Mississauga, Ontario; seven grandchildren, Theresa, Krista, Patrick, Kathryn, Jacob, Martin and Adam; five great grandchildren, Tyler, Brenan, Hayven, Isaac and Lincoln; two sisters, Yvonne, New Brunswick and Eleanor, Idaho, USA; nieces and nephews. She was predeceased by two brothers, Murray and Gerald. Cremation has taken place. Visitation will be held from 6-8 p.m. Saturday, October 13, 2018 in the White Family Funeral Home, Kentville, where the funeral service, followed by a reception will be held at 3:00 p.m. Sunday, October 14, 2018, Reverend Don Sellsted officiating. Donations in memory may be made to the Valley Regional Hospital. Funeral arrangements have been entrusted to the White Family Funeral Home and Cremation Services, Kentville.